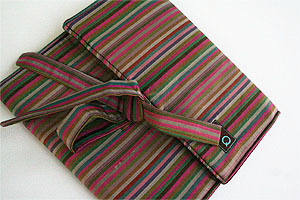 The Gorgeous and Truly Functional QUE Circular Needle Case, in a beautiful Chocolate stripe. The QUE circular needle case holds multiple circulars in 12 numbered pockets. A small zip pocket is also included for extra notions. Check out how to use this wonderful case in Della Q's Video below!